This is something new that I am working on, very strange things are taking place (stranger than “normal”.) 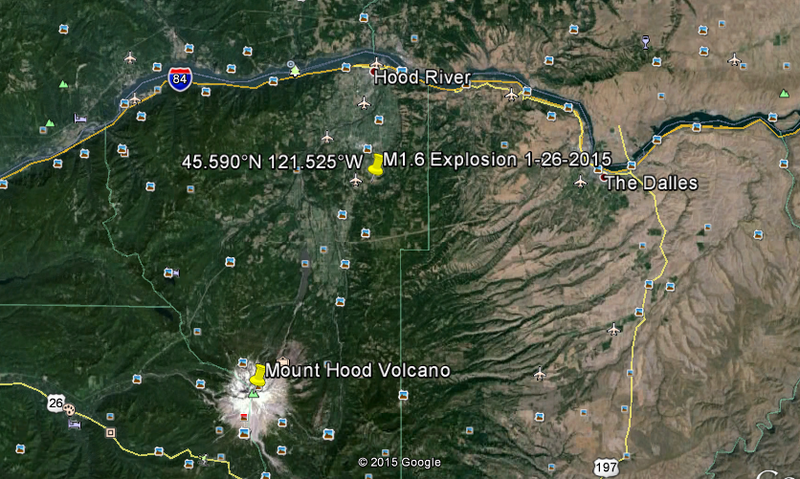 I’m still trying to figure out what exactly was going on on January 14, 2015 with all of these “explosions” being reported by the USGS. 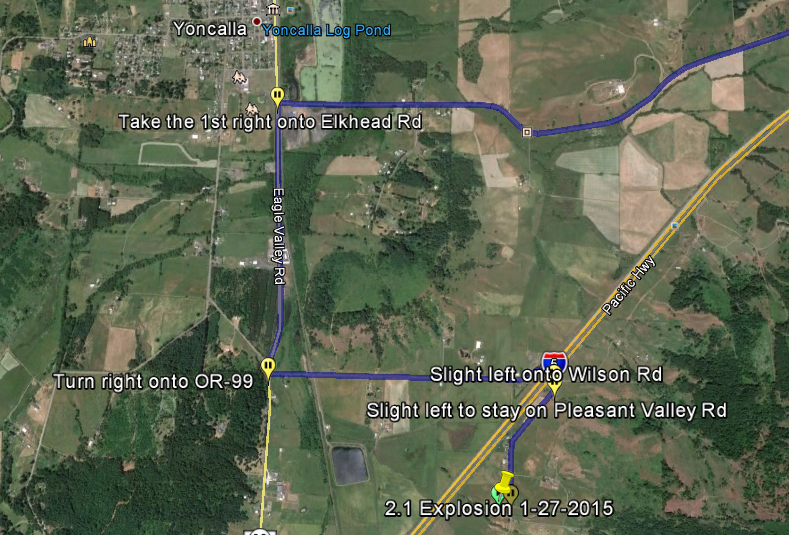 One of the “explosions” was in Cottage Grove, Oregon which is only 8 miles from me and the other occurred in Bend, Oregon which is east of me…both on the same day and other strange “explosions” other places on the same day. 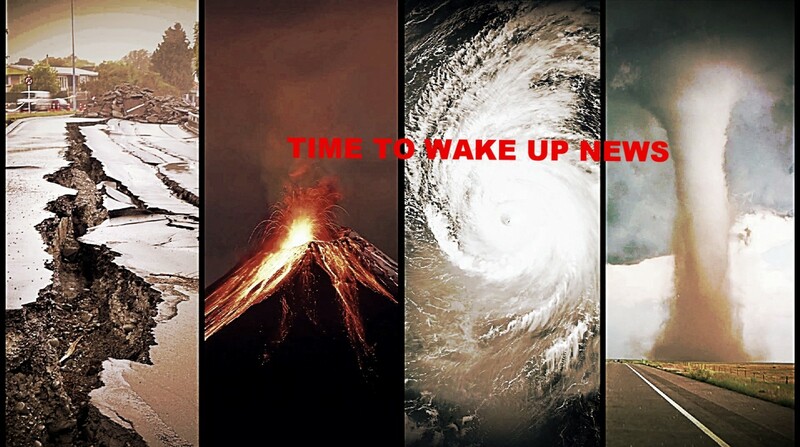 If anyone finds any new information please put links in the comment section or Inbox me. 1-6-2015: A huge chunk of ice crashed through my ceiling! 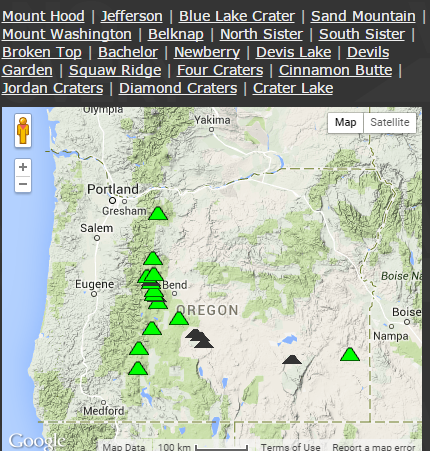 1-12-2015: 3 Earthquakes in the North-East! 1-12-2015: Hear some of the 911 calls made to Plainfield, Connecticut, police after an earthquake. 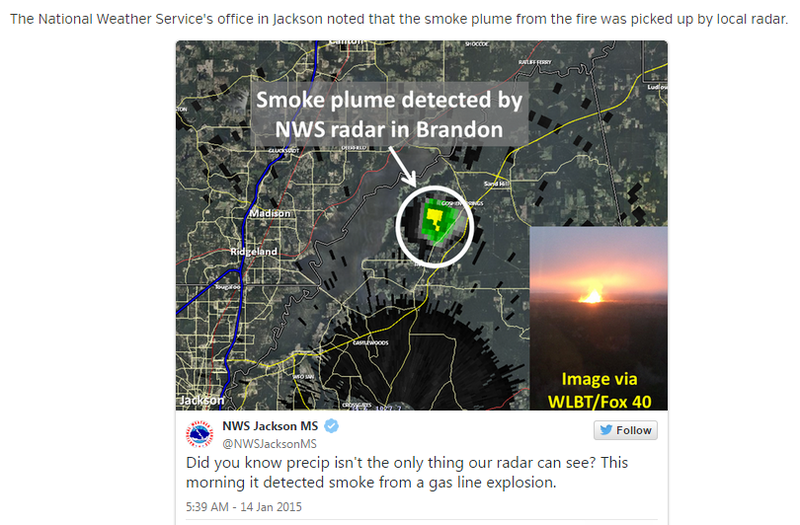 A natural gas pipeline near Jackson, Mississippi, burst into flames Wednesday morning, leaving wooded areas burned and a rare image on radar. The blast spooked nearby residents, who saw the large, orange glow in the pre-dawn sky and began to ask about its origins on social media. Gulf South Pipeline confirmed the explosion was along a natural gas line east of the Barnett Reservoir, MSNewsNow.com reported. 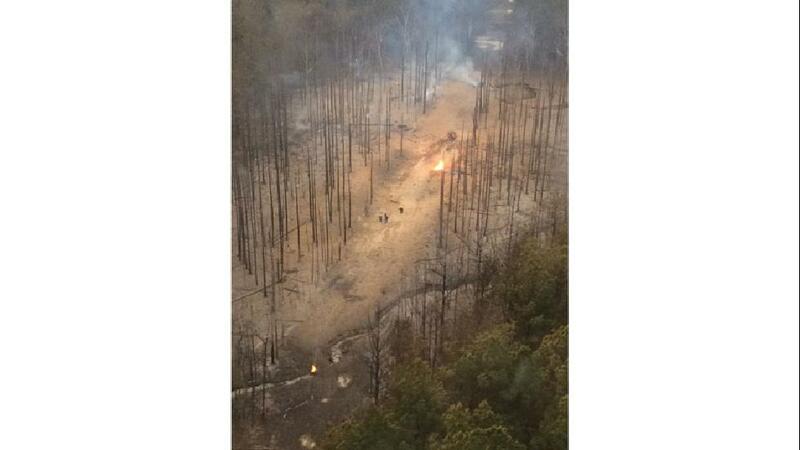 Taken from Skycopter by Jessica Golden, this image shows a torched forest following the explosion of a natural gas pipeline. 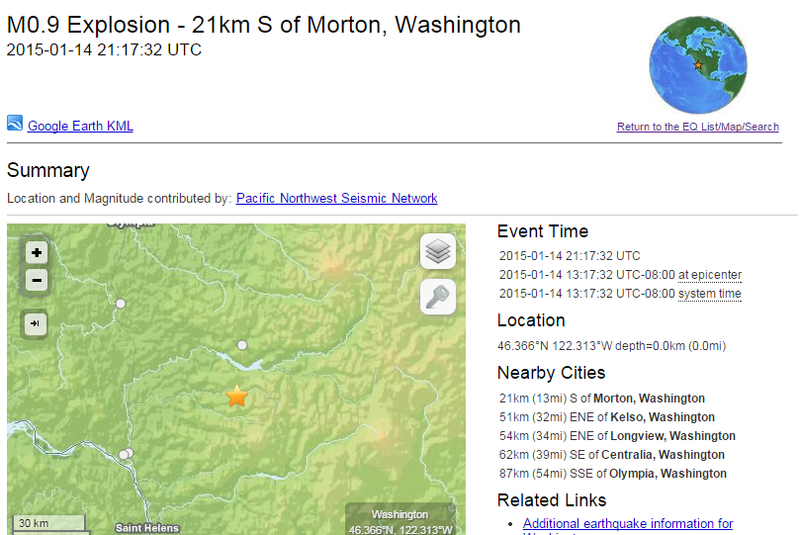 ST LOUIS (LALATE) – An Oregon earthquake 2015 did not strike today, USGS tell news. 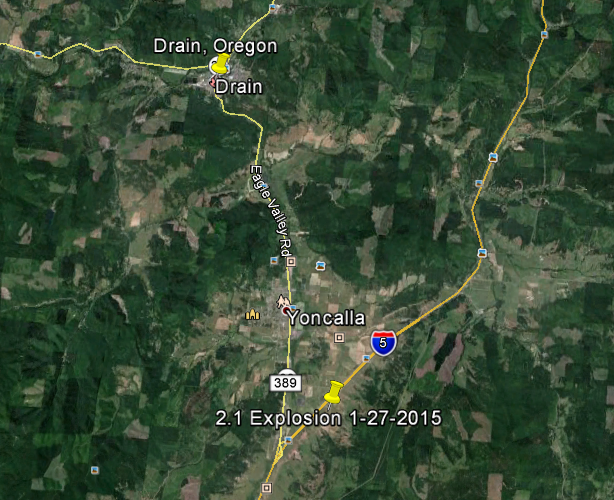 Rather an Oregon explosion struck this afternoon January 14, 2015. 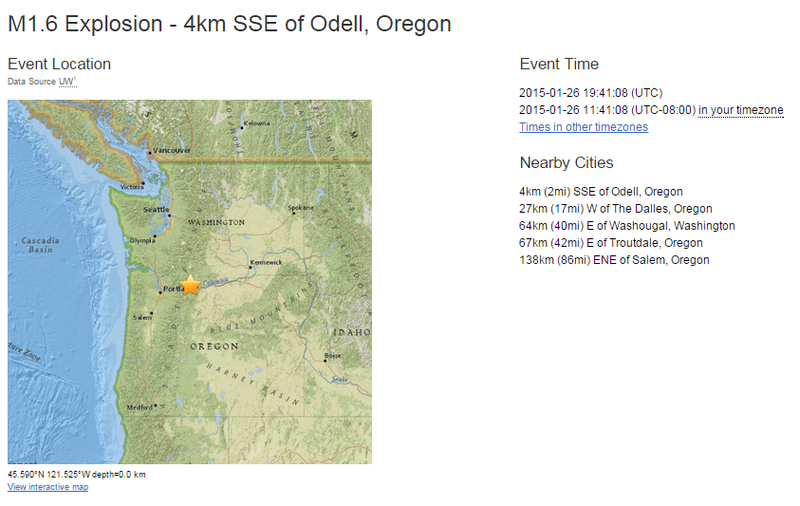 USGS indicates to news that there has been California, Oklahoma, and Alaskaearthquakes today. 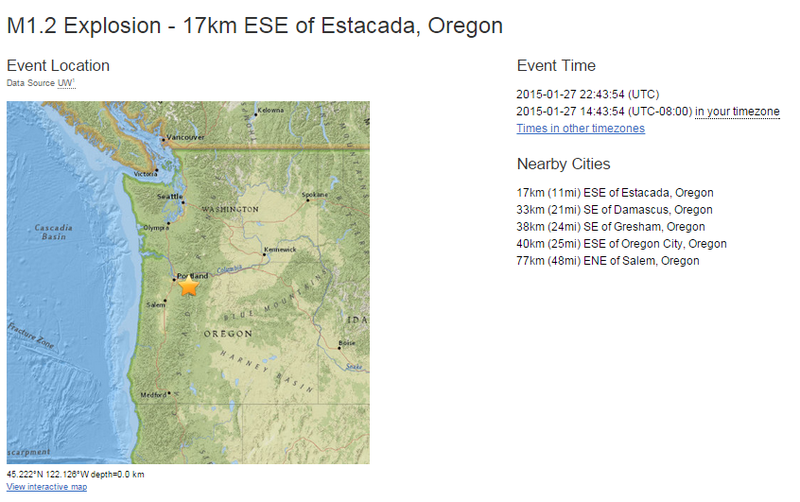 But there has not been an Oregon earthquake. 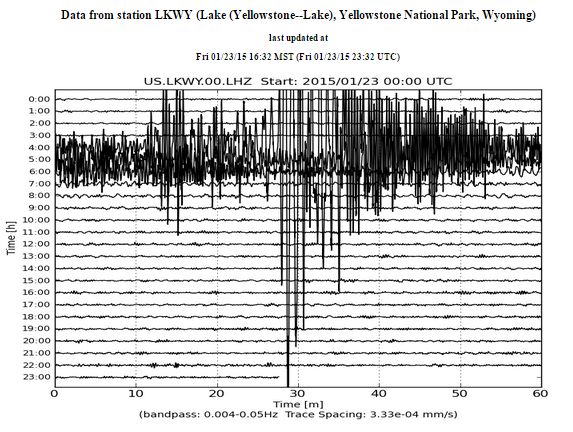 Rather theshaking this afternoon just after 1:38 pm PST was an explosion. 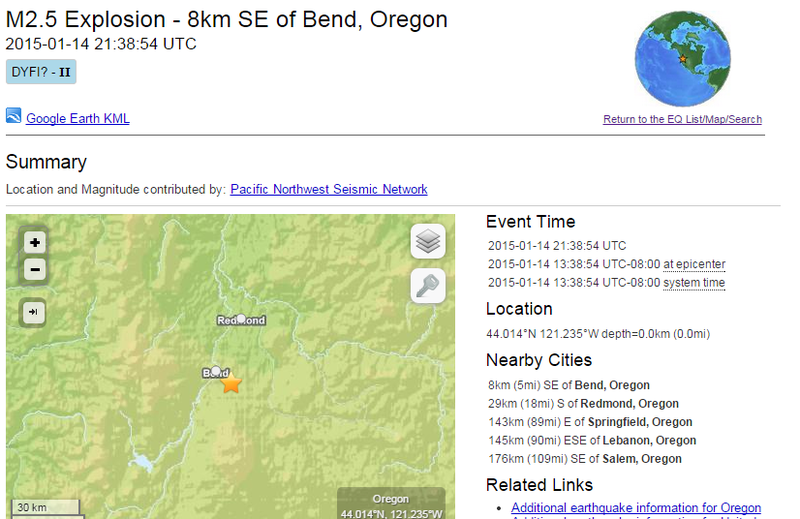 It started five miles east of Bend. It was eighteen miles south of Redmond and eighty-nine miles east of Springfield. The shaking hit ninety miles east of Lebanon and one hundred nine miles east of Salem. 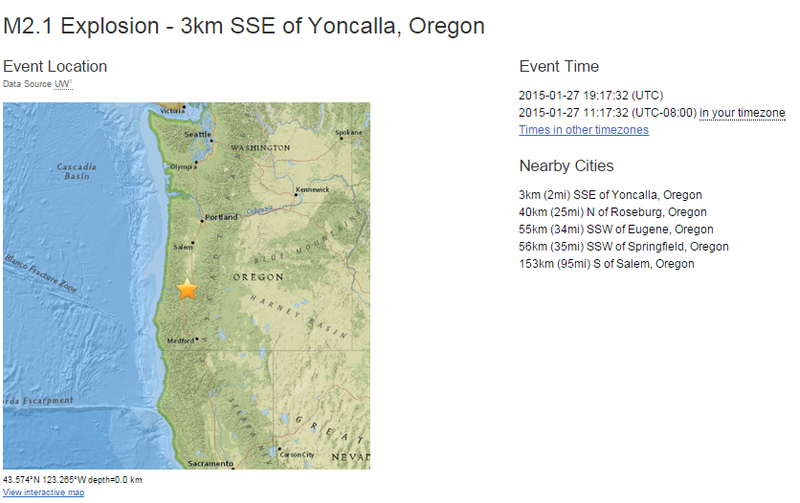 In related news, several quakes have struck Oregon in recent years. 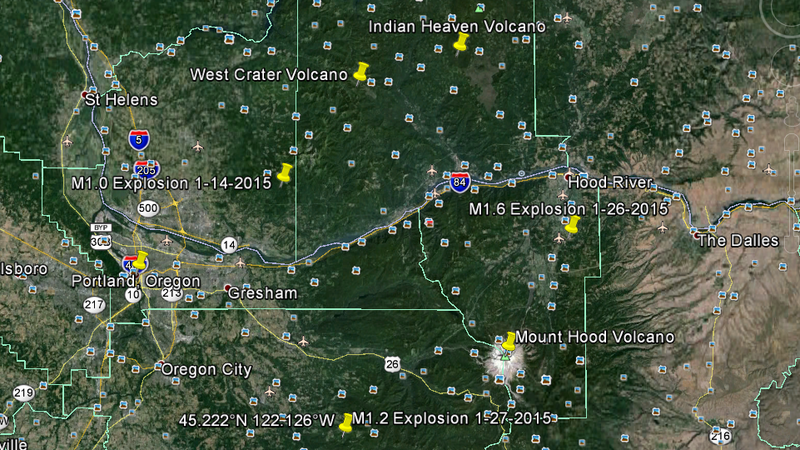 In May 2013 a quake hit twenty-three miles east of Oakland and twenty-four miles west of Sutherlin. 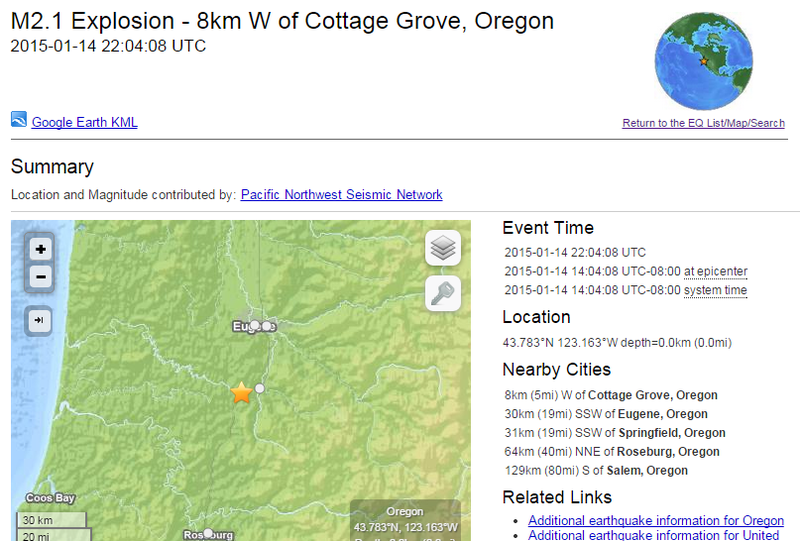 The quake also started twenty-nine miles east of Roseburg and forty-seven miles east of Eugene, reps told news at the time. In February 2012, another quake was thirty-six miles from Barview, USGS reported to news. It was forty miles from Coos Bay. 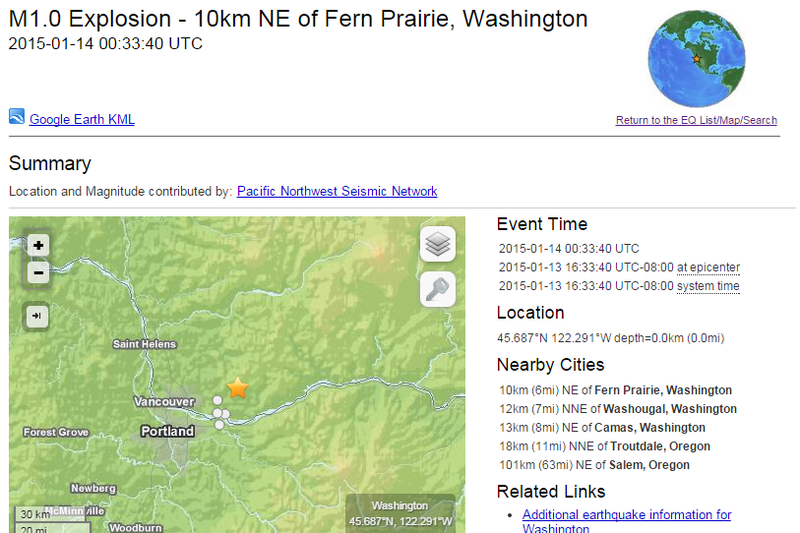 Local news put the quake roughly one hundred miles from Eugene and two hundred miles south of Portland. 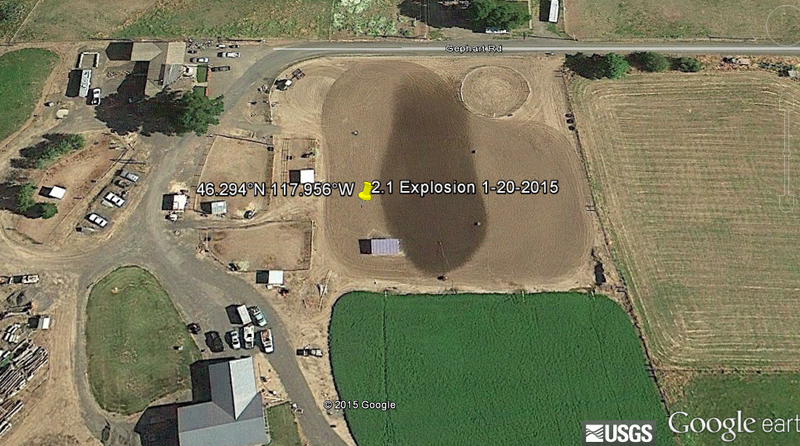 1-19-2015: BUNCOMBE COUNTY, N.C. — Mysterious booms have been reported across the Asheville area. 1-23-2015: WILSON, Pennsylvania . – Northampton County home that sustained heavy damage after a sinkhole opened has been demolished. 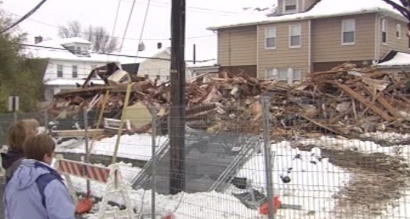 WILSON, Pa. – Northampton County home that sustained heavy damage after a sinkhole opened has been demolished. On Saturday, construction crews razed the home in the 2400 block of Freemansburg Avenue in Wilson Borough. The home became unstable after a sinkhole or multiple sinkholes opened beneath it. 1-2-2015: M5.4 Earthquake has been observed in McMurdo Station, , Antarctica at 22:07:30. I will be updating this whenever I find any new or interesting information so please do check this post often especially throughout 2015.